Of the 981 members of the Class of 2006, 751 of whom were eligible to move to another dormitory, 140 requested a housing change in the Orientation Adjustment Lottery, and only 84 of those students were able to move. New England Confectionary Co. machinists, on strike since Monday, Aug. 19 started their picket shift outside the 254 Massachusetts Ave. factory at six o’clock Thursday morning. Dr. Alan E. Siegel will be the next chief of mental health, and Maryanne Kirkbride the first clinical director for campus life, MIT announced on Wednesday. 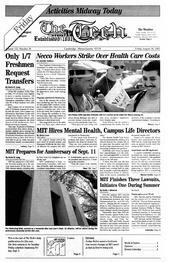 MIT has announced a full schedule of events leading up to the one-year anniversary of the Sept. 11, 2001 terrorist attacks, including talks by New York City firefighters and an all-day vigil. Over the summer, MIT, Harvard University, the Whitehead Institute for Biomedical Research, and Ariad Pharmaceutical Inc. sued Eli Lilly and Co., alleging that the company’s drugs to treat osteoporosis and an infection condition known as severe sepsis infringe a newly-issued patent.